Over in the Ask & Share forum here on Needle ‘n Thread, there’s been a little discussion about whitework embroidery threads. The question was posed whether floche and coton a broder are the same, or whether one is better than the other for whitework. This is floche. It’s a four-ply, non-divisible, softly twisted, mercerized cotton thread. It comes in one size (size 16), in a glorious range of colors. You can see most of the colors in my Love of Floche article. 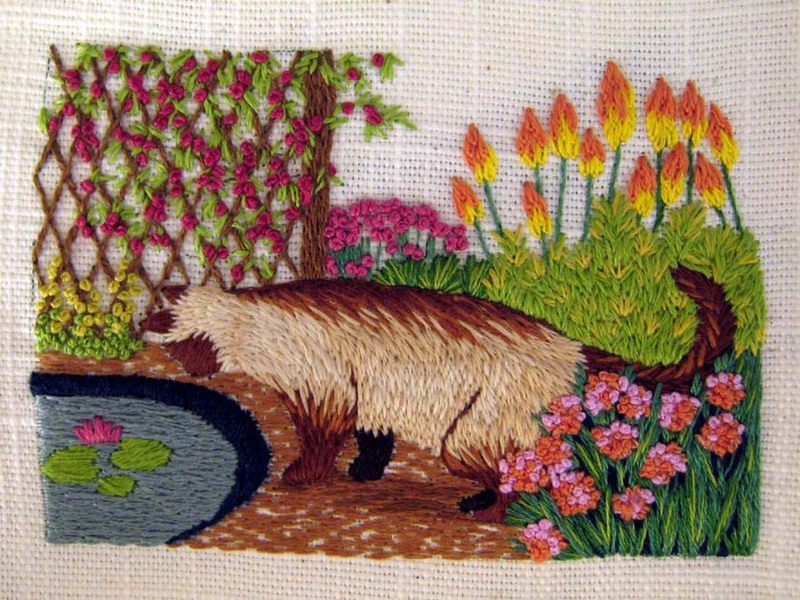 Floche can be used like regular embroidery thread to create very pretty pieces of embroidery – like the one above, which is from a kit stitched by Margaret Cobleigh. Floche, in fact, makes a beautiful thread to add to your stash for techniques that can involve all different types of threads – crazy quilters will love it, as will smockers. 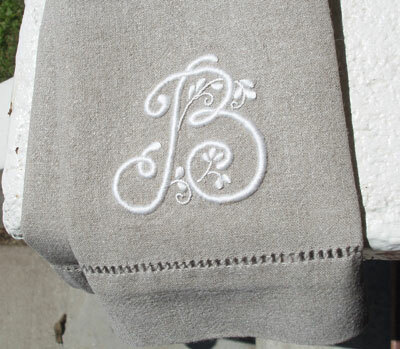 Floche makes a beautiful satin stitch, and is wonderful for monogramming projects, like this monogrammed linen towel. In some rare and unusual circumstances, the individual plies in a strand of floche can actually be divided and put back together (as in the photo above), but it isn’t the usual way to approach floche. If you’re interested in doing this with floche, you can see my tutorial on separating floche and putting it back together. 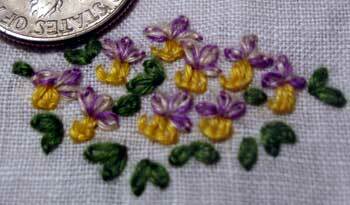 In fact, in the tiny, tiny flowers above (which are stitched with daisy stitch and buttonhole stitch), the top petals in daisy stitch are made from floche that has been divided, mixed with other colors (yellow and purple, in this case) and put back together for stitching. 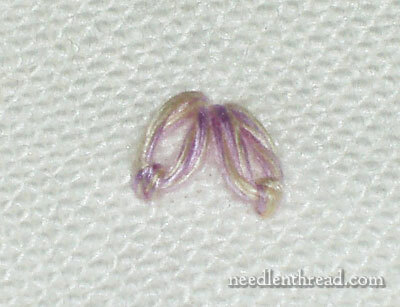 You can make all kinds of flowers out of floche, using a variety of stitches and, if you want, some blending techniques. Coton a broder is a completely different thread from floche, though they share some similarities. 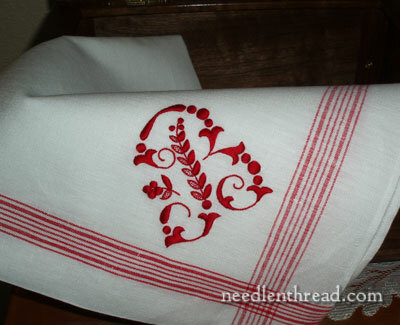 It is the ideal thread for most whitework embroidery (though not for specialized techniques like Mountmellick Embroidery, which requires a special non-mercerized thread). Like floche, coton a broder (also known as “cutwork” or “whitework” thread) is a non-divisible, softly twisted, mercerized cotton thread. 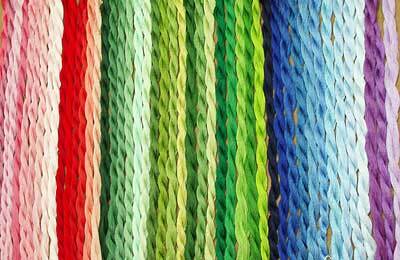 It has five plies to each strand, as opposed to floche’s four-ply strand. It is a soft thread, but not quite as soft as floche. Unlike floche, coton a broder comes in various sizes. The common range of coton a broder used to be from size 12 through 40 (higher numbers are finer threads), but size 12, 35, and 40 are no longer commonly available. The common range of sizes now include 16, 20, 25, and 30. Like floche, coton a broder does not have a wide color range, but it is available in white and ecru in most of the sizes, and in size 25, it is available in about 180 colors. 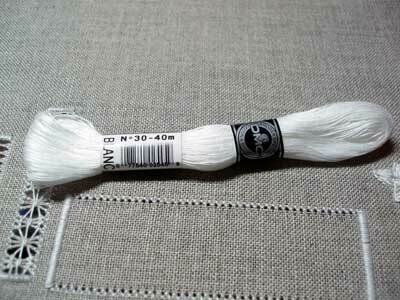 Coton a broder is used in whitework quite often. It is the “staple” thread of Schwalm whitework, for example, and can be seen in the beautiful Schwalm piece above, stitched by Luzine Happel. 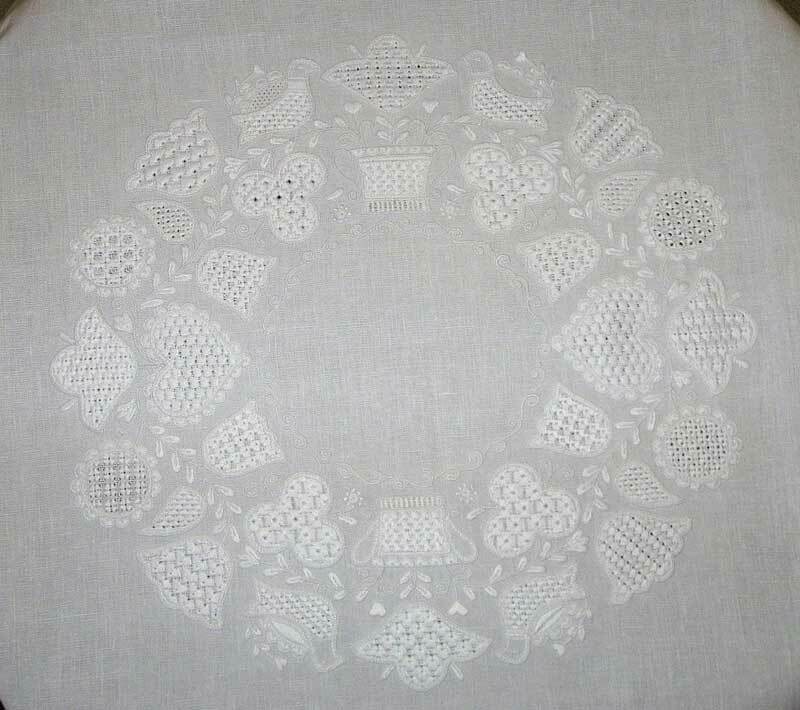 For whitework projects, it is nice to have a range of the various sizes of coton a broder on hand. While size 20, for example, may be a perfect choice for stitching a heavier element on a whitework piece, a size 30, which is finer than 20, may be ideal for stitching fine details like tendrils and vines. So, floche and coton a broder: two hand embroidery threads, similar in some ways, different in others, and perfect for the various jobs they can do! I love them both whole-heartedly! You can find the full range of floche online through Vaune.com and through Lacis.com, as well as sizes 20, 25, and 30 coton a broder. October 23, 2010 New Colors of Floche Available! I like to get the Coton a broder (cotone da ricamo) from Italy as they sell it in bigger hanks. If you use a lot of it, it’s worth it. Hi, Cynthia – I’m pretty sure floche comes in about 100 colors now (in the US), and more are available, but it just depends on when they get over here. You’re right about coton a broder coming in more colors, but it’s very rare to find them! I appreciate the resource to Vaune Pierce – they have the whole set of 182 colors of coton a broder, for $245. Ahhhhhh….. wouldn’t that be grand! As a fellow thread junkie I throughly enjoyed today’s post. In the UK we can still buy some colours in coton a broider, they are starting to get scarce and most folk buy them when they can. However I was looking for a particular number/colour from an australian magazine project and discovered that they have a much extended range of colours to choose from. Floche is an entirely different matter, as far as I can see it does not exist/very hard to come by in the UK? I wonder why? Could you please explain why it is so difficult to purchase the Broder Cottons in colour here in Canada. Where to obtain coloured Broder threads in # 25.Here in Canada we seem to only be able to purchase the DMC brand in sizes #16.#20,& #25. Hi Mary! Just wanted to point out Marion Scoular (Royal School alumnus) uses floche for blackwork projects. If memory serves, I believe she used it for Rapunzel. As to finding coton a broder, you might try a lacemaking supplier. Coton a broder is used as gimp in Honiton & some other bobbin laces. You won’t believe this, but hubby and I are planning on driving to San Francisco next weekend (10/28 – 30). I plan on making a list but I’ll put it on the iPhone so I won’t forget. You know, you really set me wondering about this Cotton Floche thing, simply because, well, I had never heard of it! So I started investigating the matter, and I found out that in Italy it is not availabile… or is it? I mean: we have a type of DMC cotton (generically called embroidery cotton) available in a wide range of colours and sizes. According to this colour chart: http://www.tuttoricamo.it/public/tabcol/107/107.pdf sizes vary between 16, 20, 25 and 30, but most shops here only carry no. 25, which as you can see is available in almost 200 colours. And in fact it’s the one that Jeanine linked in her previous comment. If I remember correctly, Laura from Ricamiamo Insieme http://www.ricamiamo-insieme.com/catalog/ in Milan told me that she had to order floche from either England or Australia, I don’t see it for sale on her website so perhaps she couldn’t find a reliable source but you could always contact her to find out. I think she told me she liked it for stuffing padded satin stitch as it was cheaper than other embroidery threads. The cotone lanato that I’ve seen was much thicker than the floche I have (which I ordered from the US) but perhaps it was just a different weight? Laura will know, she’s a DMC reseller. I looked into this a several month ago by going to the DMC website in various languages. It was a frustrating experience since both Floche and Coton a Broder are go by different names, and are available in different countries, and the DMC websites for various countries contradicts each other. Here’s what I see on the actual threads. Floche is called “Floche a broder” on the hank, article #5238A, and size 16. There are over 100 colors now but only available from a couple of the DMC importers in the US. And it’s 5 strands even though the website said four. I worked it open and counted it. Anchor also produces a line called Floche, so that may be what’s available in the UK, or one of the importers to UK got some DMC Floche anyways even though DMC website doesn’t list it. I think Anchor Floche is the same size as DMC floche but am not sure. Coton a Broder is article #107. It’s not listed in the DMC-USA site, but my DMC wholesaler started carrying them late last year. It’s also known as Broder Special, Special Embroidery Thread, Brilliant Cutwork, etc. It’s called Cotone da Ricamo in Italian and DMC-Vierfachgarn in German. The order form listed 180 colors for size 25 (171 solid and 9 variegated), and B5200, Blanc and Ecru for sizes 16, 20, 25 and 30. The color card however, claims 82 colors for size 16, 5 for size 20, 186 for size 25 and 2 for size 30, so there are additional colors available somewhere in the world. I got some actual skeins of various sizes to try out and found that it has 4 strands and sized differently from Floche. When I laid the size 16 and 25 of this next to Floche, size 25 seems to be a closer match than 16. It’s hard to tell though since the tightness of the twist aren’t quite the same. The Cotone Lanato sounds like the Article #89 which is size 4. It’s also known as Matte Cotton, and has “Retors Mat” on the the wrapper. This was around years ago (I had some from at least 15 years ago), but resurfaced recently. They are quite thick, and would be very hard to work through fabric, but would be great for canvas work, padding or couching. I love your website and find it an endless source of information and inspiration. I would love, however, to have the ability to print your articles in a Print Form with only the article minus all the “extra stuff” so I can begin a notebook for my bookshelf. I tried the Print option in extra options but it does not seem to do what I want. Any suggestions other than a laborious “copy and paste” to a work document? Hi! Thanks for all the great articles. I am just starting out with embroidery and plan to mainly do simpler designs on cotton dishtowels, aprons, and pillowcases. I have almost no embroidery thread so am wondering what would be a good way to start fresh. From all I’ve read here, I am thinking of getting a selection of coton a broder #25 and DMC Floche a Broder and/or maybe some palettes from Sublime Stitching. I know I can get cheaper regular DMC embroidery thread for less money, however, for the “smallish” amount of thread I will be using at first, the price difference won’t be much and I would like to get the best quality right from the start.